Volunteers of America-Greater New York depends on support from community partners to enhance the quality of life for individuals and families in our care. These partnerships, built on a mutual understanding of our mission to support and empower our most vulnerable neighbors in need, are essential to the success of the organization. One long-term partner, Rutgers Community Programs has “adopted” the Regent Family Residence, serving as the “go-to” sponsor for many of the Regent’s needs. Read more about this special partnership, and the creative ways they’ve brightened the lives of children living in our homeless shelters. There’s a controlled chaos in the art room at the Rutgers Presbyterian Church House. The walls are covered in projects that emulate the styles and techniques of famous artists like Jackson Pollock and Gustav Klimt. The perimeter is organized and stocked with supplies to satisfy the urge to create. 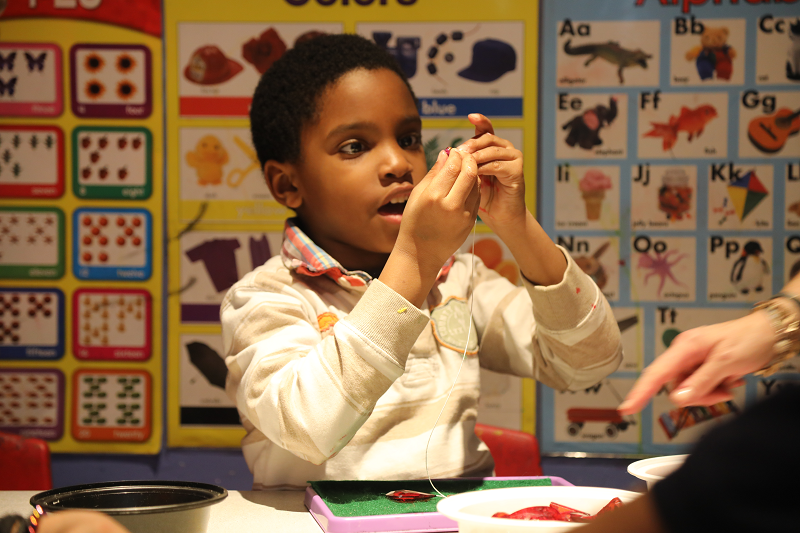 On this particular Friday, children from the Regent Family Residence (Regent), Volunteers of America-Greater New York’s (VOA-GNY) family shelter on the Upper West Side, have many crafting options available. At a low table with tiny chairs there are watercolor stations to make a Valentine’s Day craft. In the back there are easels set up where one girl masterfully paints a stylized portrait of Squidward, the cantankerous clarinet-playing neighbor from Spongebob Squarepants. Circle your gaze counter-clockwise and there are boys making bracelets with bowls full of colorful beads, stringing them together with the precision of a jeweler in the Diamond District. 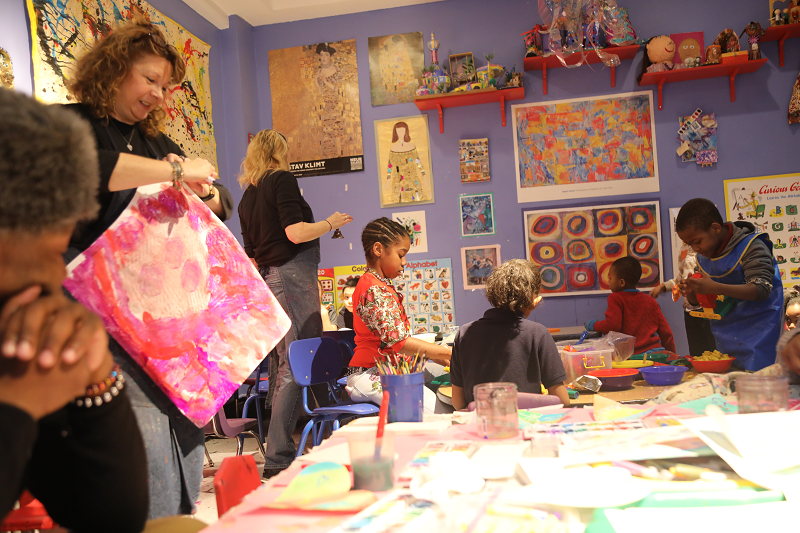 The enthusiasm in the room makes it clear that the children at the Regent truly enjoy their monthly visits to Rutgers for creative free time, a highlight of the long-term partnership that has evolved between VOA-GNY and Rutgers Community Programs (RCP). Community partnerships like this one enable VOA-GNY to enhance the quality and scope of its work – partners fix leaking roofs, refresh community rooms with coats of paint, and in the case of RCP, offer specialized services and expertise. Their support makes the difference between simply feeding and sheltering a person and helping them envision and attain a better future. The Regent provides transitional housing for families who are homeless. While a family lives with us, we address the underlying causes of their homelessness, help them find permanent housing, and provide childcare for the youngest children (ages 2-4) so that parents can keep housing, medical, and other appointments. For the school-age children we offer “recreation,” during which they have a quiet place to do their homework and receive the help and materials they need to complete projects for school. Just a mile and a half down Broadway is Rutgers Presbyterian Church, which administers and houses community programs, including classes and activities that are nonsectarian and open to all. After Hurricane Sandy hit in 2012, Dave Mammen, RCP’s Director of Administration, Programs and Special Projects, enthusiastically supported the desire of two Programs instructors – Lesley Countryman and Cindy Schaffer – to extend services to those without the means or access to art. 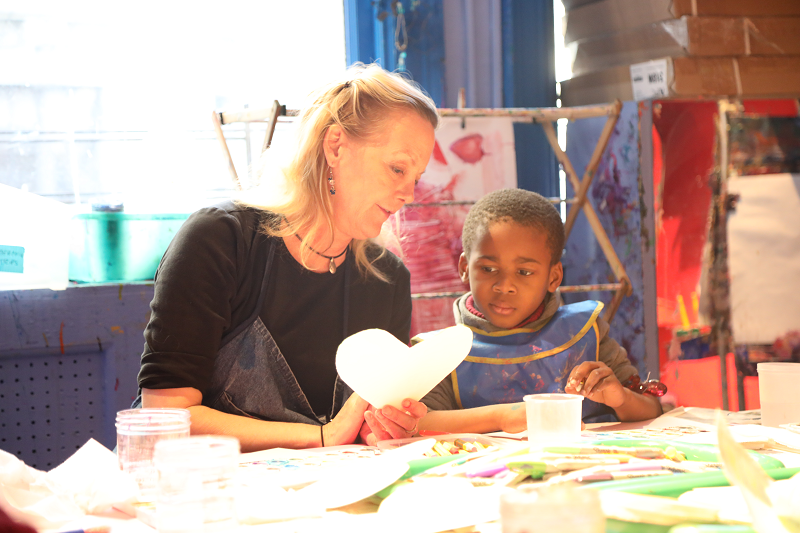 Lesley, RCP’s Art Instructor and Outreach Advisor, used a personal connection she had with a staff member at VOA-GNY, and together they visited many programs to see where RCP could best offer its support to the organization. Since then, RCP has collected books and DVDs for veterans, held gift drives for older adults during the holidays, and served as a drop-off location for Operation Backpack®. 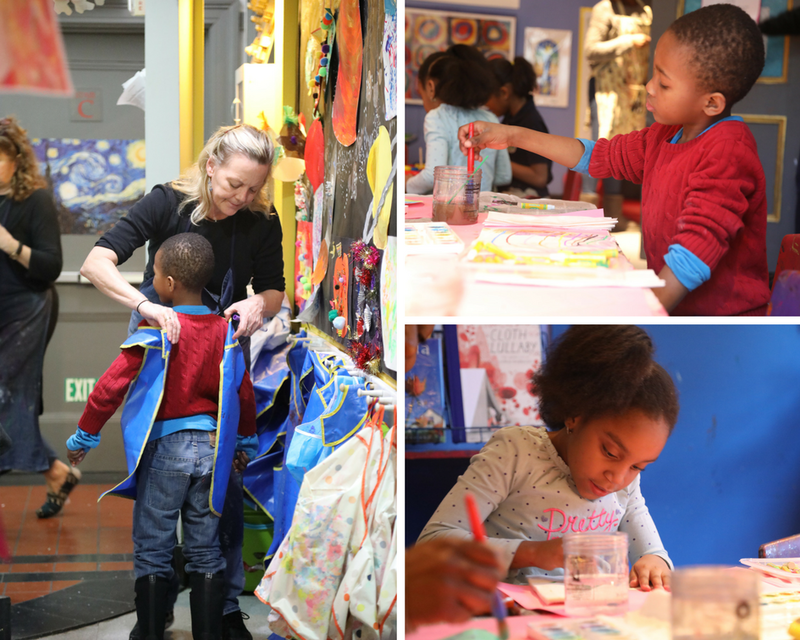 In 2014, they began hosting art classes for students attending VOA-GNY’s Bronx Early Learning Center and children living at the Regent, and the partnership clicked. Four years later, the visits from both programs continue. Through their work, Lesley and fellow RCP staff including Program Assistant Director Jennifer Moore, and Instructors Cindy Schaffer, Somer Adams, Denise LeDonne, and Therese Snider help normalize the lives of the children in our care. 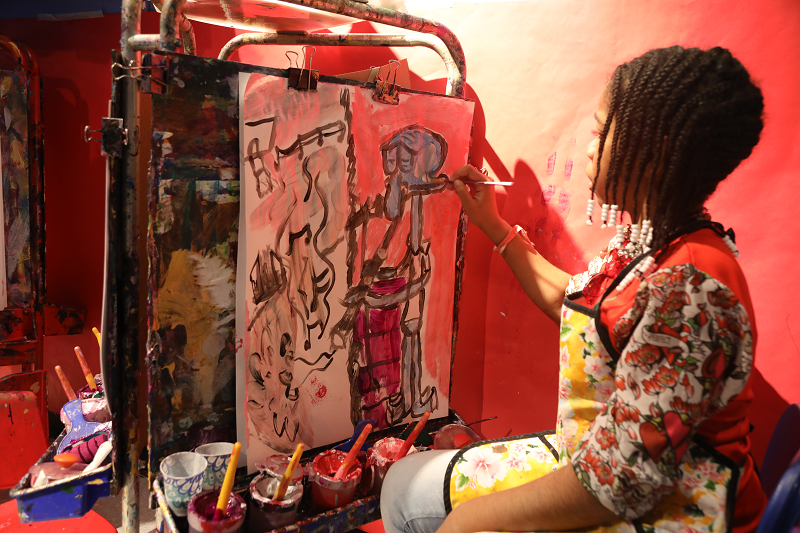 These art classes are a chance for the children to participate in an extra-curricular activity like almost any of their peers in New York City. According to the New York City Department of Homeless Services, in February 2018, there were 12,702 families living in New York City homeless shelters, and within those families, 22,603 children. The instability and anxiety of this situation is rough for anyone, but imagine that sort of burden on a child. An article in the New York Times said that children who are homeless are more likely to be disciplined in school, drop out, and face delays in identifying special needs education services. Their graduation rate is 55% compared to 74%, the average for their housed peers. However, children who have access to art as an outlet get respite from their difficult reality, build confidence and gain life skills like the ability to persevere, focus, and problem-solve, among others. When Lesley met Veronica Bermudez, the Regent’s current Recreation Manager, the partnership gained new energy and reciprocity. Veronica says the partnership goes beyond serving just the children, and benefits entire families, too. “I think they’re just an overall good support system. RCP is a place that I can always call and they do everything they can to help,” Veronica says, noting that RCP has “adopted” the needs of the Regent, helping to stock its supply closet and provide emergency items to families who arrive without diapers or toiletries. “They’re not these ‘other’ people,” Lesley adds, referring to staff at the Regent, “They are part of our Upper West Side community, real people we have a real relationship with, and the kids are just so interesting and cute.” Over the years, RCP has also begun to build personal and professional mentoring relationships with teachers like Ms. Day, Tristian, Jessica, and Veronica. Currently, RCP is collaborating with the Regent to renovate the recreation rooms at the Family Residence, so that the children can play and create in their own beautiful, calming environment; Lesley refers to the project as creating “dream spaces.” RCP interviewed the Regent’s staff to ask what they envisioned for their kids, then compiled a final wish list that includes a mix of supplies and furniture – easels, art supplies, board games, bean bags and big tables – to enhance the Regent’s recreation and childcare rooms and stimulate creativity. If you’d like to help beautify the recreation and childcare rooms at the Regent, please consider donating an item on the wish list that RCP has compiled via Amazon or contribute to their furniture fund. Or if you’re interested in building a partnership with one of our other programs, visit our corporate volunteer opportunities page for more information.